Jersey Shore Boca alum George Gelnovatch, one of the most recognized names in Boca club history, will lead Virginia to the 2006 NCAA College Cup in St. Louis as his Cavaliers defeated Notre Dame 3-2 in quarter-final tournament action last Friday. The Wall Township native played several years in Boca’s youth system during the mid-1980s during his High School years. Boca’s Gelnovatch heads to NCAA College Cup. CHARLOTTESVILLE, VA – Jersey Shore Boca alum George Gelnovatch, one of the most recognized names in Boca club history, will lead the University of Virginia to the 2006 NCAA College Cup in St. Louis as his Cavaliers defeated Notre Dame 3-2 in quarter-final tournament action last Friday. Virginia set the NCAA single-season record for total attendance as 5,850 fans watched the Cavaliers knock off the Fighting Irish giving UVA a single-season record of 43,183. Virginia advanced to the NCAA College Cup for the first time since 1997. It marks the second time under Gelnovatch, a Wall Township native, that Virginia will make a trip to the national semifinals. Virginia will square-off against national powerhouse UCLA, who defeated Duke 3-2 in overtime in their quarter-final match. 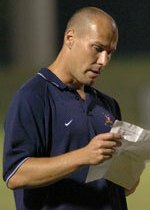 Gelnovatch, who played several years in Boca’s youth system during the mid-1980s under long-time Boca coach Walt Pericciuoli while attending Wall High School, has led Virginia to three ACC titles and ten NCAA Tournament appearances in his last 10 seasons as head coach. “It feels incredible to advance to the final four. It’s been a long time and it feels even better to do it with this group and this team. It’s unbelievable” mentioned Gelnovatch after the Notre Dame game. Over fifty Jersey Shore Boca standouts that previously played for the club on either their Men’s, Super Y-League, PDL, Club or Youth teams, participated in NCAA intercollegiate soccer this year representing their respective institutions as players and coaches in some of the top college soccer programs in the nation. They represent one of the highest numbers ever of Jersey Shore Boca players and coaches to participate in NCAA intercollegiate soccer during the same season in the Club’s 28-year history.